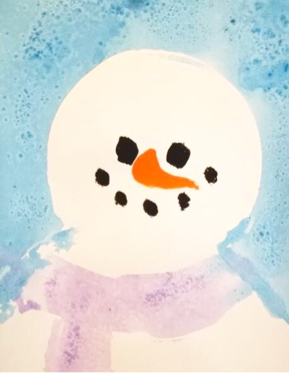 This snowman painting was so much fun and everyone adored it! This is a great simple winter activity and children of all ages can make a snowman as simple or as detailed as they like. We used a positive shape template on top of a piece of white paper, the kids painted around the template and then we removed the template leaving a perfect snowman underneath. While the paint was still wet we sprinkled salt all over. The salt reacts with the water leaving a crystallized texture when dry, it looks like sparkling snow. Lastly we painted details like the face and scarf. Step 1. Cut out a snowman pattern, I used chipboard so that it would survive kindergarten. Step 2. Place the positive part of the cut out stencil on top of white paper. Step 3. Paint around the snowman. Step 5. Remove the stencil to show the snowman. Step 6. Sprinkle salt in the wet watercolor. Step 7. Embellish your snowman as you wish.